Last month, it was discovered that Apple quietly tweaked the 16 GB Wi-Fi iPad 2, equipping the device with a smaller 32-nm die shrink of the A5 system-on-a-chip previously used in the line. The tweaked iPad 2 carries an internal identifier of "iPad2,4", which was first spotted in an iOS 5.1 beta back in November, but at the time it was unclear what the model represented. A similar die shrink of the A5 was found in the new Apple TV, and it appears that Apple made the move in order to test out production of next-generation chip processes in lower-volume devices. The A5X used in the third-generation iPad continues to be based on a 45-nm process. 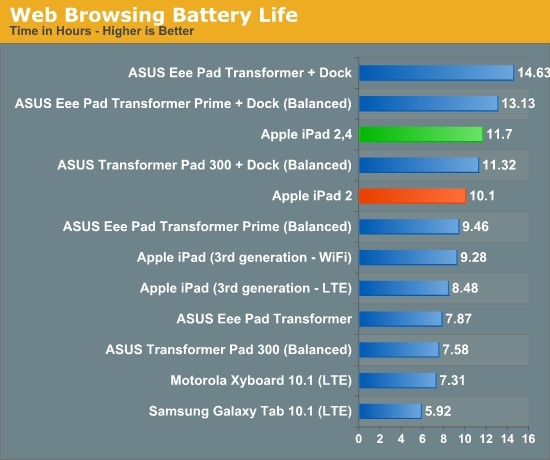 Anandtech has now < a>gotten its hands on one of these new iPad 2 models and subjected it to a series of battery life and performance tests, finding that the revised model offers identical performance to other iPad 2 models but with battery life improvements of 15-30% in several benchmarking tests. 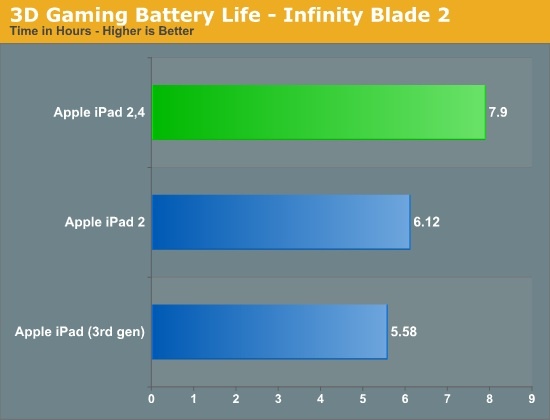 Assuming Apple didn't change any fundamentals of its microarchitecture, the iPad 2,4's gains in battery life can be attributed directly to the process. The gains themselves are significant. We measured a 15% increase in our web browsing battery life, a nearly 30% increase in gaming battery life and an 18% increase in video playback battery life. Although Apple hasn't revised its battery life specs, the iPad 2,4 definitely lasts longer on a single charge than the original iPad 2. Unfortunately, Anandtech notes that there appears to be no way for customers to ensure that they receive one of these revised iPad 2 models for their $399 purchase, as there are still a significant number of the original iPad 2 models in circulation and they can not be distinguished based without opening the box and turning on the device. What I want to know is who the hell played infinity blade for 8 hours straight? Apple is a lot more than just Mac when this site was founded in 2001. Get over it. Better in one metric. You still have a retina display, and for me that's worth it. You have a screen with 2x the resolution both vertically and horizontally, quad core graphics, and incredible optics. I would not say the iPad 2,4 is better, just running even leaner and meaner than before! I know, let's get back to info about the forthcoming PowerBook G5! That's exactly why Apple was hush hush about it. They don't want people returning iPad2's if they don't get one with the newer chip. Okay I see. Why are you saying Powerbook though? It's an old inside joke, dating back to the days of the PowerBook G4. The next logical progression, of course, was to put a G5 chip in the next series of PowerBooks, but it never happened. It was too big or it ran too hot or both. All the desktop Macs transitioned to G5s and even dual G5s and yet the portable products kept staying with the G4. So of course the rumour mills were filled with "The PowerBook G5 is coming... any day now... maybe next Tuesday! ", just like today's iPhone rumours. "PowerBook G5 next Tuesday" became a satirical dig at the rumor-mongers. The entire reason why Macs are running on intel chips today was because of Apple's frustrations with the future of the PowerPC chips. I have retina display on my iPad 2. They have a hack/tweak on Cydia. So a software hack that shrinks the physical pixel element dimensions and back fills the extra space with additional pixel elements? ...now that is one amazing software hack. I can't seem to find out how I can determine if my ipad is a v2,4.. Can anyone help me out?